OCBC Bank has long been an active philanthropic advocate, as seen through its many sponsorship initiatives and programmes. Among these is the OCBC Local Undergraduate Scholarship, which was founded on the sole belief that every individual should have the opportunity to pursue a university education. The OCBC Local Undergraduate Scholarship provides talented and passionate individuals with a springboard to pursue their dreams. 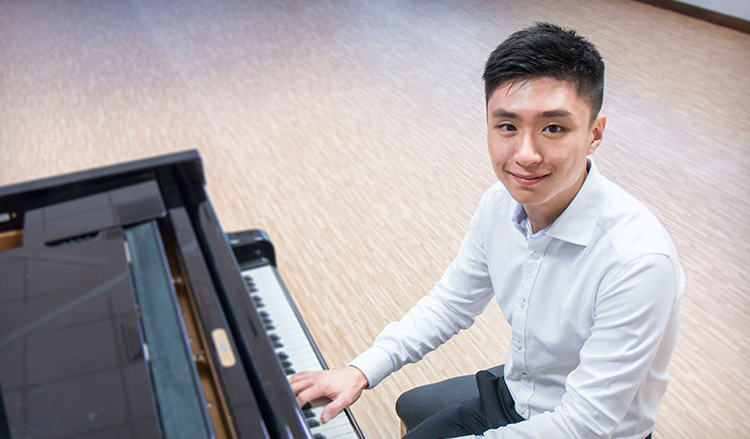 For OCBC Scholar Donald Law, this bond-free scholarship has helped him pursue his passion for music with a Bachelor of Music (Honours) at the Nanyang Academy of Fine Arts (NAFA). For Donald, music and playing the piano has always been a very personal affair. He took piano lessons since he was five and found his calling when he heard a piece by Richard Clayderman. “I love the way he expresses his emotions though his music. I wanted to mimic that influence,” he says candidly. However as his academics took precedence in the later years, this passion had to take a back seat. Other obstacles included reserved opinion of music as a career choice from family and friends. “I felt withdrawn and lost. But I was certain of my dream to be a musician and after relentlessly persuading my parents, I earned their respect and support to pursue this path,” he recalls. OCBC takes pride in ensuring each scholar is provided with ample developmental opportunities, to interact and learn with other scholars about its organisation. For a musician like Donald, the induction programmes, which he has described as “extremely interesting and a great launching platform”, have provided him with a rare all-access pass to experience the dollars and cents of the banking industry. “Being so unfamiliar with the finance sector, the experience has opened my eyes and given me new insights into the challenges faced by professions in the sector,” he shares.